Paris, New York, Chicago – Oct 18, 2017 – Enyx is thrilled to announce the launch of our new FPB2 platform powered by the Xilinx Virtex UltraScale+, a pioneering FPGA that brings our nxFeed solution to the forefront of the market. 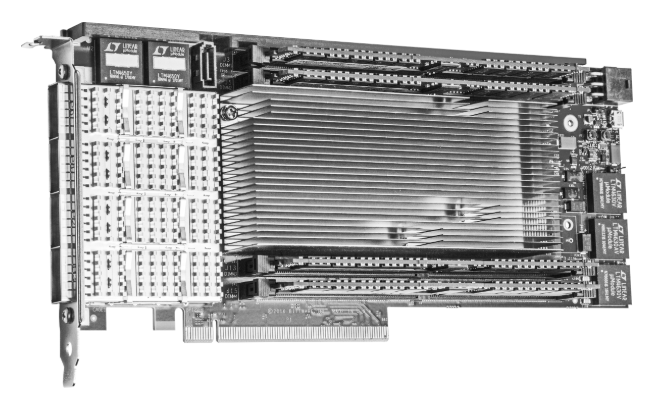 The FPB2 platform, developed by Bittware, utilizes the cutting-edge Xilinx VUS+ FPGA which offers a 4x larger matrix than our previous platform, as well as 25 Gbs Ethernet connectivity, better overall in/out latency, and a running frequency of up to 800 MHz. With the adoption of the FPB2 platform, our nxFeed solution will increase overall performance by more than 30%, thus further widening the gap between Enyx and our competitors. The latest FPGA technology to power Enyx nxFeed solutions. “At Enyx, our main goal is to provide the latest FPGA technology to answer our customer’s challenges” says Enyx Managing Director and Co-Founder Laurent de Barry. “That’s why we are thrilled to introduce this groundbreaking platform. The FPB2 platform gives our clients new, advanced options with the addition of incredible performance,” continues de Barry. Currently, nxFeed products support 40+ markets across Europe, Asia, and the U.S. with plans to increase coverage to at least 16 new markets over the next 18 months. Enyx’s Xilinx VUS+ enabled FPB2 platform will be available for production on November 1st. Our nxFeed is a full-featured market data distribution system that uses FPGA technology to shatter latency. Our FPGA-based Feed Handlers decode, normalize, and fully process market data feeds from all of today’s major exchanges before distributing to a wide range of applications. You will benefit from wire-speed performance and jitter-free determinism without sacrificing simplicity and flexibility.